retrovintagecollectables: Flash Trash Treasures are always there! My blog will be a review in text and images of around 40 years of collecting. Markets and garage sales have been the major source of my treasures. Flash Trash Treasures are always there! During my holidays, I usually check all my favourite haunts. That would be about ten different shops in our area. Some I visit twice, just in case. 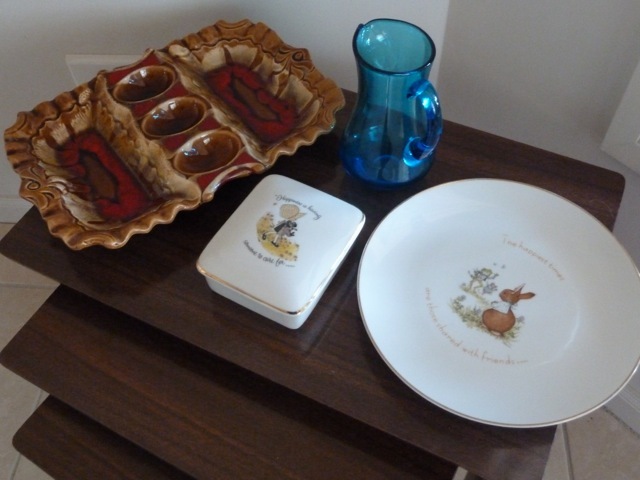 This is a shot of the only four crockery items I bought. The rest of my purchases were clothing. a very cute, little blue glass jug. I have a lot of small jugs, that I hope my family will like, one day??? a Holly Hobbie, jewellery box. I have been collecting this for my daughter who had these things in her childhood. She is putting together a collection for her little girl. a friends plate, John Sands, Made in Japan. I always pick up these plates if they are $2.00 or less. Learner, reader and collector. I am an avid collector of things I like. I have clothing, household wares and furniture from the 50s to 80s. The pleasure is in the hunt and I regularly visit markets, op-shops and garage sales on the lookout for that new little treasure. My collections remain works in progress. What collectables interest you most?